Max Fordham designed the pioneering saltwater cooling system for the greenhouse. Creating heaven on earth may not be as far-fetched as it sounds. Smart technologies and clever engineering has enabled food to be grown in the world's harshest climates. Environmental engineering firm Max Fordham has helped seven acres of ‘Useable’ land yields 130 tonnes of organic vegetables per year – with 490 acres in the coming years. The recent opening of the Sahara Forest Project (SFP) launch station outside Aqaba, the Jordan port city, has highlighted the possibility of using the some of the world’s harshest landscapes to produce food, fresh water and clean energy. Environmental engineering firm Max Fordham have been collaborating with the Sahara Forest Project since the start of the project in 2008. 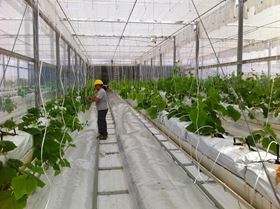 Initially they carried out research into technical aspects of the project including thermodynamic analysis of the greenhouse, to provide optimum growing conditions for crops with minimum resource input, desalination techniques, and the potential climatic effects of adding moisture to desert air. The research included building and operating an experimental rig in the Qatari desert, to verify conclusions in the field. This culminated in the development of a mathematical computer model of the entire Sahara Forest Project system, which Max Fordham and SFP then used to investigate resource flows through the system and projected investment costs and returns. The second stage of the collaboration was focused on the engineering design of the Sahara Forest Project system, firstly for the Pilot Project in Qatar, which opened in 2012 and operated for a year, then more recently for the larger launch station recently opened in Jordan. Max Fordham designed the pioneering saltwater cooling system for the greenhouse, as well as the services infrastructure which joins up and enables the different energy and growing technologies which comprise the SFP system. Max Fordham collaborated with leading experts on solar power, greenhouse operation and desalination to ensure all the components of the SFP system work optimally, allowing the system to be greater than the sum of its parts. Max Fordham provided site engineers during the construction and operation of the Qatar Pilot, to help the local engineers building the Pilot understand the system, and adapt the design during the life of the project to overcome the unforeseen challenges that inevitably come with innovation of this type. Asahi Kasei’s Microza hollow-fiber membrane selected for the Doha Phase 1 reverse osmosis seawater desalination plant in Kuwait. Dow's seawater desalination treatment is helping to alleviate Oman’s water scarcity.